I'm not a professional blogger. I don't sell advertising space on my site [yet] or make money directly from my blog. I decided early on, after some experimenting, that Frantic Mama would focus on the less glamorous side of Motherhood-- the beauty and the beast-- and not on earning potential. I first started writing as a way to vent about the less-than-rosy side of Motherhood, and I never thought I would "make friends online," but I certainly have. Which brings me to this paying-it-forward blog post. You created a Blogger or Wordpress blog and may be wondering: Where do I go from here? How do I meet other bloggers? How do I get readers? 1. Ask yourself what you are an "expert" in. Decorating? Makeup? Organization? Slow Cooker Recipes? Of course, I'm far from a parenting expert, but it is currently my life's main focus: doing the best I can as a mother of two young children, and as a wife of one great guy, while also taking care of myself and finding my own joy. I think it is best to find a niche for your blog to keep it focused. * This way, people quickly know what your blog is about, and readers can count on you to write about your specific topic. *[There are exceptions. One of my other hobbies is refinishing furniture, as this post shows. I also experiment with other types of posts. That said, about 90% of my blog is about motherhood]. 2. Reach out. Join social media outlets so that you can make connections and people can actually find you in the abyss of Cyperspace. Join Twitter, Pinterest, Instagram, Google +. Create a Facebook page for your blog. 3. Don't expect people to magically come to you. Just like friendships in real life, you have to give a little to get a little. Visit other like-minded blogs, add comments, like them on Facebook, follow them on Pinterest. Don't think of other bloggers as competition, especially if you aren't trying to monetize your blog. No one will read and comment on your posts if you aren't sharing the love. 4. That leads me to my next tip: return the love. If someone does take time to write a comment on your post, add you on Twitter, follow you on Pinterest-- and they aren't completely insane-looking-- follow them back. This could be a future blogging friend for you! 5. Carve out time. Blogging is a hobby that I thoroughly enjoy. Writing in general is my passion (reading is a close second). Therefore, I use my rare free time to write. If my husband is with the kids for a bit on the weekend, or I have an hour to myself after the kids go to bed, I guarantee that I'm using that time to write (or cut my toenails)-- not to scrub the kitchen floor, bake homemade cookies, clean up all the toys, talk on the phone, or whatever else people do when left to their own devices. 6. Add your blog to Bloglovin. This is my favorite way to keep track of blogs I read and to forge and maintain connections. 7. Include images. I was so clueless when I first started blogging that I didn't even know how to add an image to my post! There have been cases where well-meaning bloggers get into trouble using copyrighted images, so I urge you to add your own photos or find free images online. 8. We are getting a bit more advanced here, but try a Blog Hop. These are link-ups where you add your blog to a list of other blog links, and then visit and comment on other the blogs. Again, you need to do your part by sharing the love, but you might just gain some new followers this way. 9. Respond to comments. I use Disqus comments on my blog (more advanced, so find a tech blog with further instructions). It should go without saying, but if someone writes a comment on your blog, respond to it! 10. Last, after you have been blogging for a few months, join a blog directory in your niche. You can find Frantic Mama on the TopMommyBlogs site because it connects to my target audience. If you are a style blog or a design blog, search for communities in those categories. BlogHer is another valuable site, as it encompasses countless blog topics and encourages conversation. 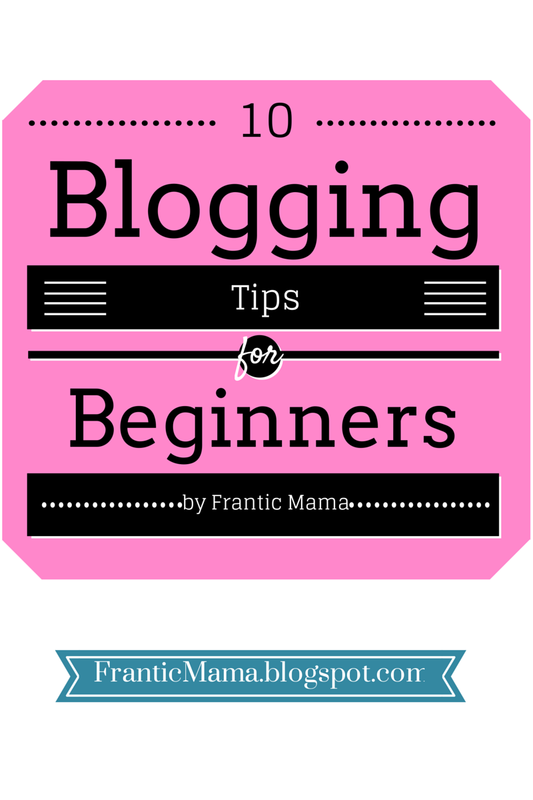 I hope this is helpful to any new bloggers reading; I did not know any of these tips when I first started blogging. Making blogging friends, or creating a tribe, is the number one way to feel supported and encouraged in the vast, sometimes murky waters of the Internet world. Seasoned Bloggers: What am I leaving out? Anyone else have advice for new bloggers? New Bloggers: What has challenged or stumped you about blogging so far? Clash of the Couples, an anthology I'm in, is AVAILABLE! You can like the Facebook page here for funny previews!